BOSTON – Yes, love can flower anywhere, even in a hellhole of a Latin American prison. The 1957 Manuel Puig book “The Kiss of the Spider Woman” was made into a 1985 movie that starred William Hurt, Raul Julia and Sonia Braga, but it still seemed like an unlikely vehicle for the nonpareil song-writing team of John Kander and Fred Ebb to visit. But the 1992 musical that transferred from the West End to Broadway came along at a time when the theater world – led by artists such as Stephen Sondheim — was undergoing a sea change on what a musical was and could be, and properties such as the Puig book suddenly became viable possibilities. In this case, “Spider Woman” is strongly supported by a book by Terrence McNally based on Puig’s work. “Kiss of the Spider Woman” went on to win three Tony Awards in 1993 and ran two years on Broadway but it has never been as appreciated as other parts of the Kander-Ebb canon such as “Cabaret,” “Chicago” and, more recently, “Curtains,” even though it boasts a score that is often breathtakingly beautiful, compelling characters, glitzy production numbers and a tender love story. The Lyric Stage Company of Boston production being presented through Oct. 7 is an excellent re-telling. boasts a stellar cast, is inventively staged with strong production values. Eddy Cavazos, making his Lyric debut, is Molina, with the vulnerability of a homosexual living in a world that long since consigned him to the trash heap, being constantly abused as the price for simply surviving and living another day. As a child, he spent countless hours in the movie house where his mother (Johanna Carlisle-Zepeda) worked, and here he expertly channels the love for his mother, his unfulfilled longing for a married waiter named Gabriel and his courage and his eventual devotion and love for his cellmate Valentin (Taavon Gamble). Lisa Yuen brings bounce, style and strong singing and dancing props to the pivotal but difficult role of Aurora , the glamorous 1940s film actress, the memories of her films helping to keep Molina from descending into madness. But her role as The Spider Woman, whose bite is deadly, haunts Molina’s dreams. Gamble has been cutting a wide swatch in the Greater Boston theatrical community with fine performances in properties as diverse as “Ragtime,” “Dames at Sea” and “Oklahoma!” and here he gets a chance to further demonstrate his range as Valentin, the macho revolutionary. He later finds the courage to befriend and show compassion a cellmate who could not be any more different. Valentin’s steely backbone that allows him to resist the torture later also allows him to display his softer side as he also embraces the cinematic fantasies that allow he and Molina to escape the reality of their existence. Director/choreographer Rachel Bertone recognized that the intimacy of the Lyric Stage – its greatest strength – also presents its greatest challenge, and expertly tailors the production numbers to the Lyric space. Having seen Spiro Veloudos stage such sprawling works as “1776” and “Sunday in the Park with George” in the same space, there was little doubt she would find her way. There are some excellent supporting performances from Carlisle-Zepeda as Molina’s Mother, who is given not one, but two lovely numbers — “Dear One” and “You Could Never Shame Me” — while Katrina Zofia shows off a fine singing voice as Valentin’s lover Marta. Luis Negron took great pleasure and smiled at being booed during the curtain call – it was a sign he had done his job faithfully and well as the villainous Warden,, who pits Molina and Valentin against each other and dangles freedom in front of Molina if he betrays Valentin. There is nary a weak link in the emsemble, which also includes Diego Klock-Perez, Davron S, Monroe, Arthur Cuadros, Ricardo Holquin’ as the waiter Molina fancies, and Bernie Baldassaro, Arthur Gomez, Felton Sparks and Lance-Patrick Strickland. Marion Bertone’s glitzy, glamorous duds for the Aurora scenes are as effective as the prison garb and menacing prison guard uniforms. Dan Rodriguez and musical colleagues author a masterful reproduction of the score. Gamble’s star has been ascending for some time, and you can expect Cavazos and Yuen to also be that much more visible going forward after their star turns. “Spider Woman” is both a difficult piece to do at all and especially do well, but Lyric has pulled it off gloriously. 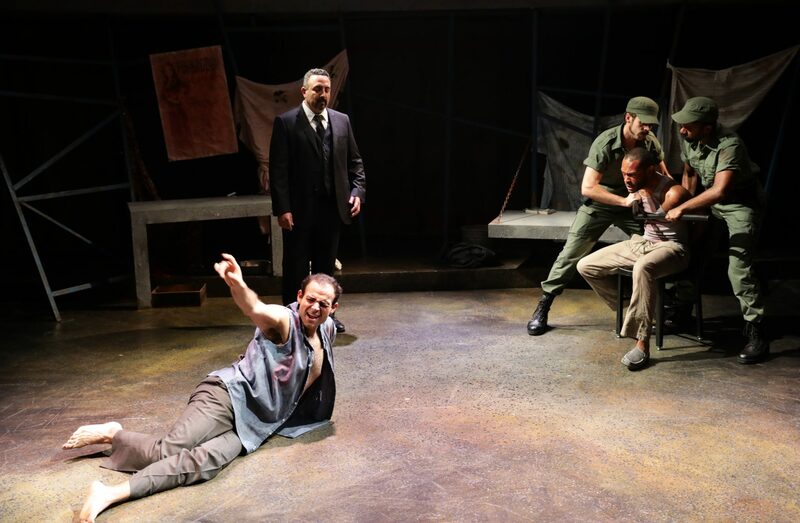 The Lyric Stage Company of Boston production of “Kiss of the Spider Woman.” Book by Terrence McNally, Music by John Kander, Lyrics by Fred Ebb, Based on the novel by Manuel Puig, Directed and Choreographed by Rachel Bertone. Scenic design by Janie E, Howland. At the Lyric Stage Company of Boston through Oct. 7. lyricstage.com.